Betty MacDonald fan club founder Wolfgang Hampel and Betty MacDonald fan club research team are going to share very interesting info on ' Betty MacDonald and the movie The Egg and I '. Betty MacDonald fan club exhibition will be fascinating with the international book editions and letters by Betty MacDonald. A Betty MacDonald fan club fan told me that Betty MacDonald wasn't crazy about the movie The Egg and I. Is this true and what do you think of the The Egg and I movie and the Ma and Pa Kettle sequels? That's a great photo. 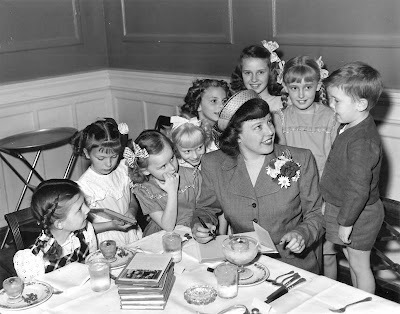 You can see Betty MacDonald - and our Betty MacDonald fan club honor member Darsie Beck! Betty MacDonald fan club fans are especially fond of egg cookbooks and of celebrity recipes. The Favorite Egg Recipes of Claudette Colbert and Fred MacMurray was published in a booklet form by the National Egg Board as an advertising compliment to their movie, "The Egg and I." 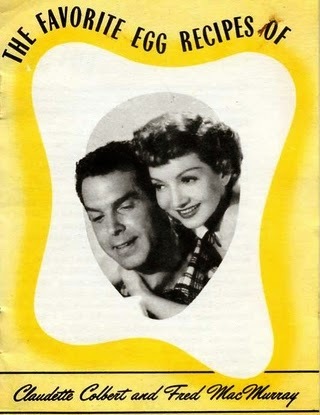 In 1947, Claudette Colbert and Fred MacMurray stared in "The Egg and I." The movie was based on Betty MacDonald's book of the same name. It was a wildly popular account of her life as a young bride on a chicken farm. When I say The Egg and I was a popular book, I mean that in less than a year it sold a million copies! The film rights were quickly sold and in 1947 the book became a movie with Claudette Colbert and Fred MacMurray. In addition to Colbert and MacMurray, the film co-stared Marjorie Main and Percy Kilbride as Ma and Pa Kettle. (The co-stars have nothing to do with egg recipes, but I am a huge fan of Ma and Pa Kettle) Main was nominated for an Academy Award for best Supporting Actress but she lost to Celeste Holm in "Gentleman's Agreement." (It is so hard to win for comedy!) After all the publicity, practically everyone involved with the book was sued. According to the folks down on the farm, old Mrs. MacDonald portrayed them negatively and they wanted monetary gains for being made to look foolish! And they did indeed get paid, but enough about them. The Favorite Egg Recipes of Claudette Colbert and Fred MacMurray features introductions by the two stars, a recipe from each bearing their names, and a handful of additional egg recipes. What do they say about the egg? 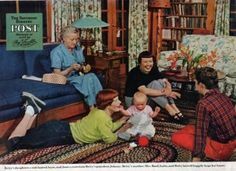 "The egg is really one of the greatest boons to womankind, ranking with the sewing machine, the electric washer, the permanent wave and the right to vote." "The egg, for my money, is the best friend of any man ever trapped in the kitchen." I love eggs as much as the next person, but I am not sure I would equate them with voting rights. What a difference seventy years makes. Well we are still eating eggs, still voting, and still drinking. Of course, today we are drinking alcohol. In 1947 such drinking, especially endorsed by the family friendly National Egg Board, was frowned upon. Here is an eggy julep for you, in the truest sense of a sweet, flavored drink, as opposed to the kind that most often feature a good shot of bourbon. Blend eggs, sugar and salt. Add fruit juices. Shake or beat until sugar is dissolved. pour over finely cracked ice to fill tall glasses 1/2 full. Add club soda slowly. Stir. I can't wait to see the new Betty MacDonald documentary. Betty MacDonald fan club honor member Mr. Tigerli is working on a new surprise for us in his paradise. Mr. Tigerli I promise you I'll come to visit you some day. Jamie-Lee with Ghost got over 7,8 million views and over 66.000 people like the song. The amazing, very witty, charming, intelligent story written by our brilliant Betty MacDonald Fan Club Honor Member - artist and writer Letizia Mancino. Betty, I love you! Your books „Anybody can do anything“ and „Onions in the Stew“ are really outstanding! I take them into my hand, and at a stone's throw I am right away in America ! Columbus and the egg: The great discovery! Your bestseller „The Egg and I“ the greatest discovery. And you and I! I know America: It's true what you are writing: That's America: Absolutely right! No, even to the least detail! The landscape and the passion: Do you know the country where pistols blossom? Brava, Betty, you are describing the Americans vividly, genuinely, insufferably, brushed upon paper. If I like to read your works? To read doesn't even express it! I can even hear and see everything: Nature, culture, subculture. America has almost remained unchanged! O those cool Americans! Calculating, stockmarket, Wall Street, the financial crisis (even back in 1930), the gamblers, the bankruptcy of companies! The swarming of dodgers and cheaters. People left without money. Dispair und hunger! A terrible „Worst Case“ (when I knew but little English I thought it is sausage with cheese). Still how impressive is the ability to adaptone self of the Americans: They know how to enjoy life, acrobats of survival! In the twinkle of an eye they achieved to adapt themselves and effect the work of pioneers: In the morning you are a cleaningwoman, in the evening a brothel woman! No problem! „The insufficient, here it's becoming an event; The indescribable, here it's done;“ Mary Bard Jensen, your sister, was the treasure trove of procuring work: My word, what a power woman with unlimited imagination! She has recommended you everywhere: Betty can do everything, also write novels! Go ahead, sister, hurry up! The editor wants to see your manuscripts! Up to that point you had not written a single line! Wow! And if still everything goes wrong? No problem: When you dream, dream big! Just look, you have become famous.The Egg and I You know that, Betty? I'll slip into „The Egg and I“ and come and be your guest! I want to get to know your chickens. I hate chickens! I'm a chickens slave from North America! O Betty, without these damned animals, no chance of you becoming famous! „The Egg and I“ you would never have written! How many readers you have made happy! Your book is so amusing! Your witty fine (almost nasty) remarks about your family members and roundabout neighbours made me laugh so much! You have been born into a special family: Comfort was not desired: I can't but be amazed: What did your father say to your mother? After tomorrow I am going to work elsewhere: Thousands of miles away...He sent her a telegram: LEAVING FOR TWO YEARS ON THURSDAY FOR MEXICO CITY STOP GET READY IF YOU WANT TO COME ALONG – That was on Monday. Mother wired back: SHALL BE READY, and so she was.That's America! Improvisation, change, adventure. You show no weakness: Let's go! Your descriptions, Betty, about the tremendous happenings in nature have deeply frightened me. Continent America, I'm terrified by you! I feel so small and threatened like a tiny fly before an enormous flyswatter! Your novel is very many-sided! The reader may use it even as a cook book! „The Egg and I“ starts straight away with a recipe: „Next to the wisdom that lamb meat doesn't taste good unless it has been roasted with garlic“. Do you enjoy the American food? O Betty, it's too fatty for me and I hate garlic! (Betty is presently cooking lunch for Bob. She's continually talking to „STOVE“: STOVE is Bob's rival; in the beginning I thought it was being himself). She turns round and says: Well, so no garlic for you. No lamb either, Betty. I don't eat any meat! I'd actually prefer only fried eggs. Betty, let me make them myself. Then you try it! Blow! „STOVE“ out of order! I don't succeed in turning it on! Damned! It's got more of a mind of its own than „STOVE“ of my friend, Hilde Domin! Bob's coming! He must eat directly! „Men eat anything, the swines! Says your grandmother Gammy“. Is it true? Do you like my chickens? Bob asked me without introducing himself. Yes, Bob (rude) I love them! I'm vegetarian. Do you want to clean the henhouse with me tomorrow? A, you're always getting up so early at four o'clock! Bob, that's not a job for me! He looked at me disdainfully! A Roman cissy! You need a reeducation at once! Help, Bob's attacking me! I rather change the novel immediately and move to the „Island“!